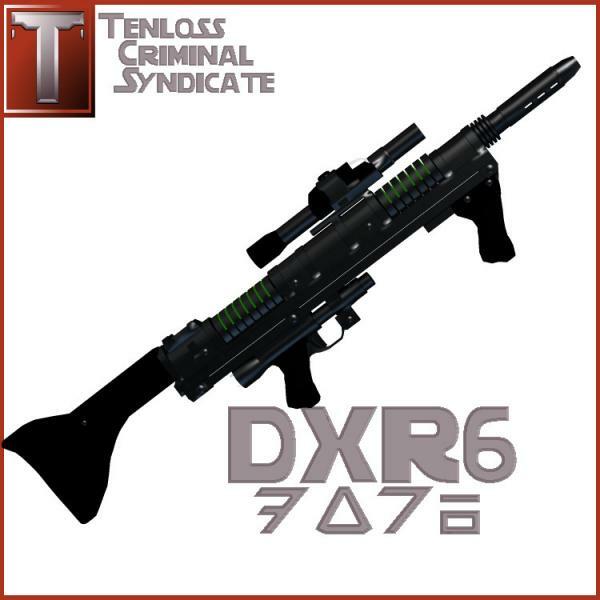 The Tenloss DXR-6 disruptor rifle was a rifle outlawed by the New Republic but still produced by the Tenloss Criminal Syndicate and used by some outlaws and criminal elements. Disruptor weapons, a generally illegal subset of blaster weaponry, could disintegrate matter at the molecular level and rip apart living material with ease and speed. The DXR-6 could be fitted with a zoom scope, making it an effective sniper rifle at great distances. Please remember to donate to keep the freebies flowing. Treinamei (4 years ago) Inappropriate? I LOVED this weapon in tabletop star wars, my droids had these and were wreaking havoc on my enemies in the campaign! MCDLabs (6 years ago) Inappropriate? I have had some PC Issues since Nov. Finally recieved my new beast earlier this month. As soon as I get all my software installed and settled in I have some HALO stuff coming. KrouseR (6 years ago) Inappropriate? All your stuff is fantastic! snessuk (7 years ago) Inappropriate? Excellent ! .. More SW weaponry please !! !